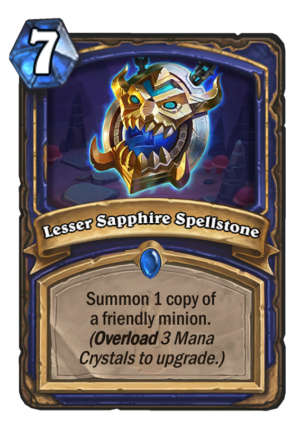 Lesser Sapphire Spellstone is a 7 Mana Cost Rare Shaman Spell card from the Kobolds and Catacombs set! Rating: 2.7/5. From 1572 votes. Summon 3 copies of a friendly minion. 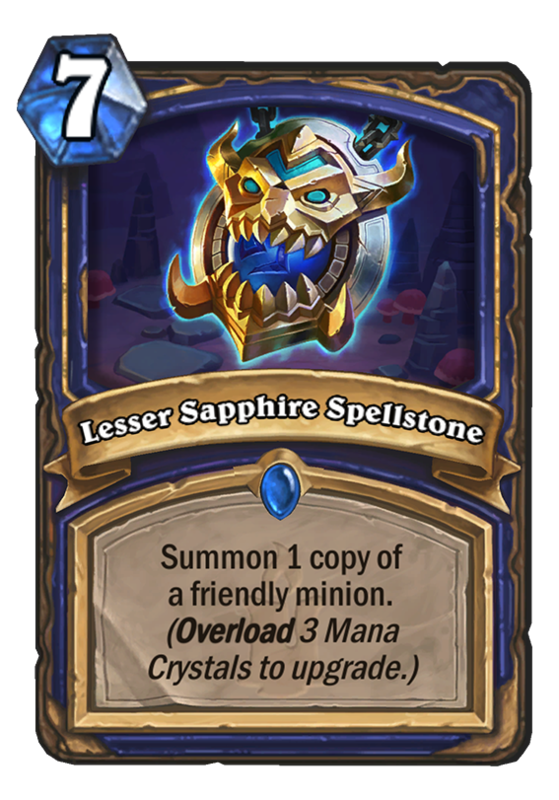 Unlike this card’s Druid alternative, the Sapphire upgradable spell does not look too exciting at first. It’s a class-restricted Faceless Manipulator on a spell, however it costs a lot more. In this frame, the Lesser version of the Spellstone seems unplayable, although an argument could always be made for critical mass – if your deck wanted Faceless Manipulator in the first place, wouldn’t it want more of them? Probably, but such a deck does not currently exist. It might however, once you unlock the Spellstone’s upgraded version. Even the first upgrade is already exactly opposite its Lesser version in terms of value – now costing less than two Manipulators while doing the same thing. The Greater version of this card is some amazing value, that much is certain. Now, the question becomes “Can the Spellstone deck exist?” On one hand, Overload is bad. Not as a mechanic, but as a cost. It’s a drawback on powerful cards and as such, it is a punishing mechanism. 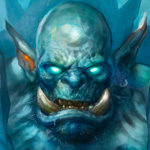 Current Shaman decks actively avoid Overload cards, however we cannot overlook the synergy with the new Snowfury Giant from KFT. Keeping in mind that the vast majority of Shaman’s controlling tools are Overload cards, the “Overload deck” could become a real thing. 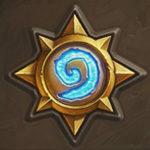 I imagine it will have a somewhat similar play pattern to the current Evolve Shaman where they have the Doppelgangster + Evolve combo for two rounds of powerful board floods, except it’s a Snowfury Giant + Greater Sapphire Spellstone combo for two rounds of very, very powerful board floods of 4 8/8s. Something to keep an eye out for is the fact that the Spellstones only upgrade while they are actually in your hand (as far as we are aware right now, anyway), so that can be a major downside to this type of strategy. Big Shaman will be a thing once again. List of Creatures this works great with. Al’Akir, Aya, Earth Elemental, Flamewreathed Faceless, Snowfury Giant, White Eyes, Cairne, Chromaggus, Thaurissan, Rag, It goes on but you get the idea, All teh Giants work great with it if you can play them out for 3 or less. BOOM add nine Moorabis to your hand. I got this off the Spellstone Mechanic Guide from this site. Bit of a let down but I still think these cards have potential. I do like how Blizz is adding more cards that benefit from Overload like Snowfury last expansion. Idk how viable they’ll be but they’ll be interesting either way. Okay, I think this card is better than you guys give it credit for. Of course it can be used on Aya on board if she survives but it has obvious synergy with cards like Thing from below and Snowfury giant. Drop that 0 mana 8/8 then copy it 2-3 times and you got a big board. Or use it on Carnivorous cube that will be on meta. I think it has pretty good synergy with turn 6 doppel + evolve into this. Overall seems like a superior card to jade chieftain as this one is 99% guaranteed 2 extra 8/8 or 5/5s. Terrible top deck though, hope shaman gets some extra card draw, else you will be running double manatide and double stonehill just to keep this card viable.